I have settings as shown in the screenshot, and would expect that I would see method signatures chopped if they exceed my margin settings (240), but that is not what I see. 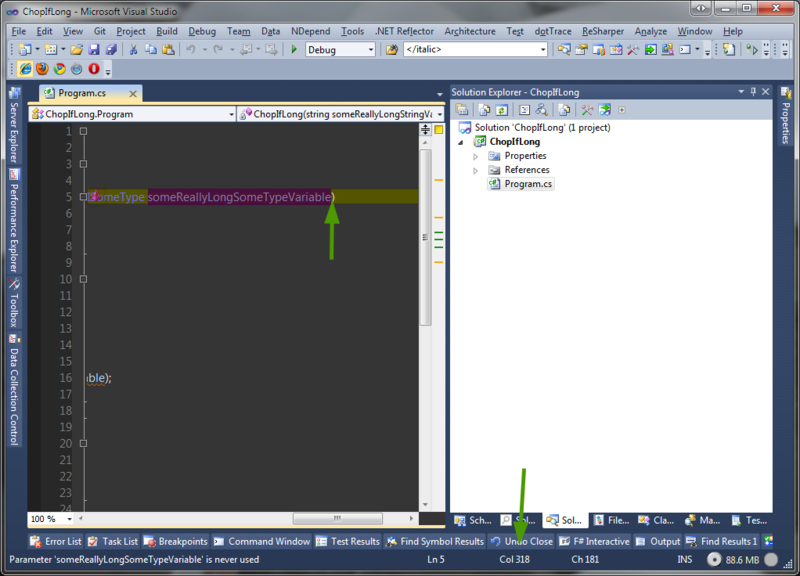 I have a method signature I just tested, that is at column 355 which did not get chopped when I ran a full code cleanup. Is this is expected behavior, a bug or am I missing something in my settings? Any help is greatly appreciated. I should mention that I'd previously formatted the signature with a chopped format, but this was subsequently ignored during a signature refactor, which put all the parameters on a single line. are you using at the moment? (240), but that is not what I see. Attached are my R# style settings and a sample app in a zip archive. 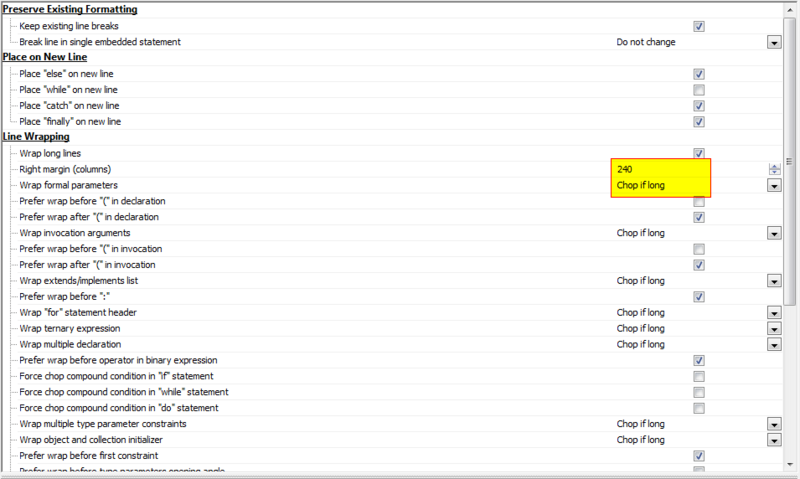 Neither the method signature nor the call to the method signature are being chopped, even though BOTH are beyond the 240 column mark. An significantly enhanced Add Reference dialog for managed code projects. This is regular extension tester. Enables Feature Extensions built with Feature Builder to run. JetBrains dotTrace Performance 4.5.1 package for Microsoft Visual Studio. For more information about dotTrace, visit http://www.jetbrains.com/profiler/. Copyright © 2005–2011 JetBrains, Inc. This package exposes a margin which enables .Net Regular Expressions find/replace on the current file. Prevent accidental Drag & Drop in Solution Explorer, Group Items, Locate In Solution, Create Code Contract, Copy/Paste References and many many others! Provides automation for creating WoVS extensions. Visual Studio add-in that integrates .NET Reflector into Visual Studio to allow you to seamlessly debug into third-party code and assemblies, even if you don't have the source code for them. Visit www.red-gate.com for more information. Copyright (c) 2009-2011 Red Gate Software Inc. Copyright (c) 1996-2010 Atomineer - Written by Jason Williams. Copyright (c) 2006-2010 Fog Creek Software, Inc. All Rights Reserved. Copyright (c) 2008-2009 Huagati Systems Co.,Ltd. 188 and the method call is at Col 147, so they should not get wrapped. Attached are my R# style settings and a sample app in a zip archive. being chopped, even though BOTH are beyond the 240 column mark. find/replace on the current file. 3.5.2519.0 Copyright © Microsoft Corporation. All rights reserved. even if you don't have the source code for them. Then I'm completely confused. Please see my attached screenshot, where I place a cursor, and then read the column mark from the bottom of my VS window. bar and turned off Word wrap and it still shows that it ends on Col 188. I understand that Col represents the width, and Ch represents the number of characters. Therefore, with Tab settings set to Tab-2, a tab would be 1 Ch and 2 Col. Here's a screencast of the Col and Ch counts - with very unusual behavior. I realize this thread has gone off on a tangent, so if anyone could direct me to another resource to track this behavior down, I'd appreciate it.